“A nation reveals the nature of its political culture in its choice of scandals.” That’s not a maxim, but it ought to be. I first thought of it in 1992, when the German economics minister and vice-chancellor Jürgen Mölleman was forced to resign because of what was called the “Letterhead affair”: He had used departmental stationary to write in support of a relative’s business marketing to wholesalers a plastic chip that shoppers could keep in their wallets and use instead of a 1-mark coin as the deposit on a shopping trolley. “A clever idea!” he enthused. (“Eine pfiffige Idee.”) At the time I thought it reflected well on German politics, that they could hatch a scandal of such unrelieved banality; I compared it with Italy, where at the same time politicians in the pay of organised crime barely rated a mention in the national news unless underaged prostitutes were involved. Twice as well, actually, at least when giving birth. According to this article, the hyperluxury private hospital wing where the DoC gave birth to our new royal master, may have cost as much as £10,000, or $15,000. The average American woman gets twice as good a birth experience, worth $30,000 according to the bill, which must be a pretty goddamned awesome hospital suite. And then, because this is such an amazingly great country, she gets the price discounted so that only $18,000 has to be paid, on average. What a deal! It’s no wonder that Americans refuse to be reduced to the kinds of primitive, parsimonious conditions that even the future queen is subjected to in England. Kate’s lucky she got out of there before they set the leeches on her. In honour of the newly announced maturation of the royal zygote into an air-breathing royal neonate — and its generous decision to head off a constitutional crisis by choosing to make do with only half its potential complement of X chromosomes — who is already predestined to rule over Britain, even while he is likely to be occupied less with affairs of state in the near future than with spitting up curdled royal milk from HRH the DoC’s royal mammary glands, I am reposting my proposal from two years ago, occasioned by the royal wedding. 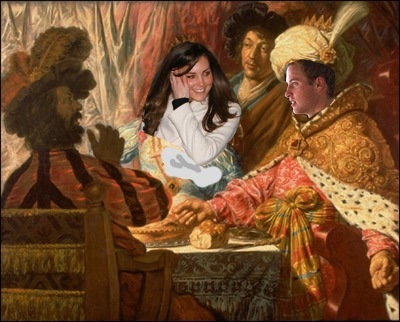 The proposal has been unaccountably ignored, despite its prospects for improving the democratic legitimacy of the monarchy. I can only infer that the neglect is due to a basic discomfort among the British elite with the innovations of modern science (unlike the innovations in, say, tax accounting, of which they tend to be avidly fond). The idea of hereditary legislators is as inconsistent as that of hereditary judges or hereditary juries; and as absurd as an hereditary mathematician, or an hereditary wise man; and as ridiculous as an hereditary poet-laureate. Following the wedding, a selection of at least 5 royal spermatozoa** will be extracted and fully sequenced by a specially selected team at the Royal Institution for Genetics Pedigree Studies. The secret method (which, in a nod to popular taste, does use beer as a reagent) has been designed to be maximally non-destructive. The sequences will published on the website princesperm.gov.uk. The public will have 5 days to register and vote for the one that they prefer be invited to form their new ruler. 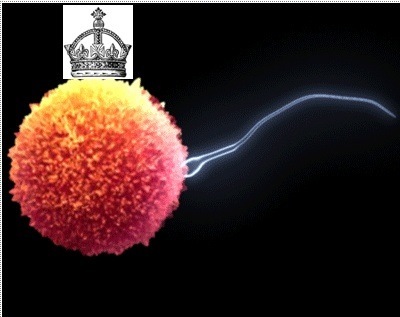 The elected sperm will be invited in the first instance to inseminate the royal egg. Should it fail in its attempt, the second-place sperm will be sent in. In the case of a repeat failure, a national referendum will be held to determine the correct voting procedure. * It may be argued that this election proposal, being purely fictional and even farcical, has no bearing on the justification or not of the British monarchy. A dangerous argument indeed, for those who would dispense with fiction and farce would leave central pillars of the British constitutional order bereft of all foundation. ** Why are the future queen’s eggs not also sequenced? Choice of the ovum is a royal prerogative, cf. Blackstone, Commentaries on the Laws of England, v. 5, section 113 (Oxford 1765-1769). CIA agent Robert Lady, convicted of kidnapping and sentenced to 7 1/2 to 9 years in prison in Italy, has been arrested in Panama under an international arrest warrant. For some reason, though, the Panamanians have not held him, but have allowed him to board a plane bound for the US. He probably think he has cleverly eluded justice. The joke is on him, though, because as we all know, the US is now a passionate advocate of international cooperation in arresting international fugitives, and of the rigorous enforcement of extradition treaties. So we can be sure that Mr Bob (as the Italian press has apparently taken to calling him) will be on his way back to Italy in handcuffs soon. Unless… But it can’t be that kidnapping (and abetting torture) is seen as a less weighty crime than publishing embarrassing political secrets. Can it? Unlike the US, Germany has a constitutional court that doesn’t kowtow as soon as the government yells “National Security”. Whereas the US Supreme Court has chosen to rewrite Catch 22 as a legal judgement, saying effectively that no one has standing to challenge secret government surveillance programs, because they are secret, hence no one can prove (using information the government will allow to appear in open court) that they have been affected. In 2001 the police chief of Baden-Württemberg Erwin Hetger demanded a programme of advance data storage, by which all connection data of web surfers in Germany would be stored for six months. The Bundestag did, in fact, pass such a law in 2007. But in 2010 the Constitutional Court annulled the law. While such advance data storage is not necessarily impossible under the German constitution, the constitutional requirements for such an action would be very strict, and were not satisfied by the law that was passed. The president of the Constitutional Court Hans-Jürgen Papier specifically emphasised that if such data were to be stored, it would have to be done in a more secure way than the law had required. The comparison of this process — where the basic parameters of privacy rights and government snooping are set by the normal democratic process of legislatures passing laws that are then reviewed in publicly accessible court decisions — just makes clear how supine the US courts and Congress have been, as has been the UK parliament. Avastin didn’t fail the clinical trial. The clinical trial failed Avastin. This is, in technical terms, a load of crap, and it’s exactly the sort of crap that double-blind randomised clinical trials are supposed to rescue us from. People are generally prone to see patterns in random outcomes; physicians are probably worse than the average person, because their training and their culture biases them toward action over inaction. The system of clinical trials that we have is predicated on the presumption that most treatments we try just won’t work, so we want strong positive evidence that they do. This is all the more true when cognitive biases and financial self interest are pushing people to see benefits that are simply not there. Author steinsaltzPosted on July 16, 2013 July 16, 2013 Categories AcademicTags clinical trials, medicine, pharmaceutical industry, statisticsLeave a comment on Avastin didn’t fail the clinical trial. The clinical trial failed Avastin. Snowden has enough information to cause harm to the U.S. government in a single minute than any other person has ever had. The U.S. government should be on its knees every day begging that nothing happen to Snowden, because if something does happen to him, all the information will be revealed and it could be its worst nightmare. I am not making moral judgements. I find this rhetoric understandable, though clearly, whatever Snowden’s motives — and no one in politics has unmixed motives, nor should they be expected to have — by placing this dangerous information in the hands of persons unknown with some kind of dead-man’s trigger, he’s clearly increased the likelihood of it being released accidentally, which is quite a responsibility to take upon oneself. But I’m thinking about Greenwald’s position. So far, despite the wish of some grandstanding congressmen to criminalise his role, Greenwald has clearly been a journalist. The Obama administration seems eager to draw some kind of line between “real journalists” and everyone else to prevent his administration’s witchhunting from completely gutting press freedom, so they might have played along. But they seem eager to prosecute national security leaks to the extent that they can find a bright line separating a given case from the bulk of journalism. Greenwald has given it to them, and I would be surprised if there were not a secret grand jury preparing charges against him for attempting to pervert the course of justice, or whatever the US federal term is for that. However he meant it, Greenwald’s announcement sounds an awful lot like the language of blackmail, and that’s surely plenty of a hook for them to hang him on. This moves him from being a reporter to being a participant or, as I’m sure they’ll phrase it in the indictment, a co-conspirator. Blackmailing the feds is a pretty heavy game to play. What’s the connection between Ben Franklin and Don Lockwood (Gene Kelly’s character in the 1952 film musical Singin’ in the Rain), aside from being the Americans most famous for felicitous activities during a rainstorm? I was watching the film recently, and was struck by the opening scene, which I had forgotten, where the hero, movie star Don Lockwood, narrates his biography, and we see Lockwood’s intimation of a sophisticated, upper-class upbringing — “[Mum and dad] sent me to the finest schools, including dancing school. . . We rounded out our apprenticeship at an exclusive dramatics academy… We played the finest symphonic halls in the country.” — humorously intercut with images on the screen of low-class reality — tap-dancing in a pool hall and fiddling in burlesque theatres, piano in honky tonks and whorehouses, being slapped by parents, etc. According to these opinions of the Americans, one of them would think himself more obliged to a genealogist, who could prove for him that his ancestors and relations for ten generations had been ploughmen, smiths, carpenters, turners, weavers, tanners, or even shoemakers, and consequently that they were useful members of society; than if he could only prove that they were gentlemen, doing nothing of value, but living idly on the labor of others. I care not who my ancestors were. I care who my descendants will be.